One of the oldest names in Japanese video gaming, Namco is a publisher of many talents. Perhaps chief among them throughout its history is its ability to look at what its competitors are doing and make its own, often better version. It reached near-comical levels with SEGA in the 1990s, where SEGA would release a new arcade game, and Namco would chase it with their spin on the concept. This wasn’t new behavior for them, either. Like most Japanese developers in the early era of gaming, Namco started popping out Space Invaders clones before the paint had dried on the cabinets of Taito’s seminal hit. Namco’s Galaxian added colorful graphics and aggressive enemies to the concept, launching a franchise that still pops up here and there, more than 35 years later. In the last few weeks, two tributes to Galaxian and its sequel Galaga released on the App Store. One is a clever modernized take on the formula with lots of replay value, and the other came from Namco themselves. I don’t want to give Galaga Tekken (Free) too much of a hard time. After all, it’s just a promotional thing clearly tossed together on a lark to celebrate Tekken‘s 20th anniversary. It’s just amusing that such a thin effort would come from the publishers behind the original game when just over a week earlier, an indie developer had released its own excellent spin on the series. At first glance, you might assume Galactic Nemesis ($0.99) is one of the many half-hearted, copycat shoot-em-ups you can find in the App Store. I suppose that’s what happens when you wear your inspiration on your sleeve. But it’s actually much, much more. Galactic Nemesis simultaneously expresses its love for Namco’s classic and advances upon it sensibly, resulting in a game that feels like it was dug out of an alternate shoot-em-up history. Now, don’t get me wrong, I love a good bullet-hell shooter. They’re exciting, they make you feel like you’re way more awesome at games than you might actually be, and should you invest yourself further in them, they yield tremendous satisfaction in their high-level play. For a long time, they were the proverbial last one standing for a genre most had written off as dead. The App Store has plenty of them, ranging from the best of the best to some that clearly don’t get the point. But there’s more to the shoot-em-up genre than bullet-hell, and while that particular type of shooter has been covered and then some for mobile gamers, more traditional efforts along the lines of Star Soldier or Gradius seem to be rarely pulled off well. We need more games where your character’s hit box isn’t a handful of pixels weaving between a torrent of shots. That’s one the reasons why I enjoy Galactic Nemesis. Space Invaders beget a ton of games, but it took a long time for them to shake the game’s wave-based format. A group of enemies would come in and make a formation, you would pick them all off, then the next level would start with a new wave of foes and you’d do it again. Eventually, we started to see more games that eschewed this in favor of scrolling levels, like Namco’s own Xevious. The enemies still arrived in waves, but they were much smaller and tended to cruise off the screen if you didn’t hit them during their attack. That went over well, and pretty soon every shooter was doing it. The next time I remember seeing waves in the traditional sense was in Space Invaders Extreme, which had discrete stages containing multiple waves of foes who would stick around until you shot them. Galactic Nemesis takes a similar approach, having you work your way through levels made up of multiple waves. 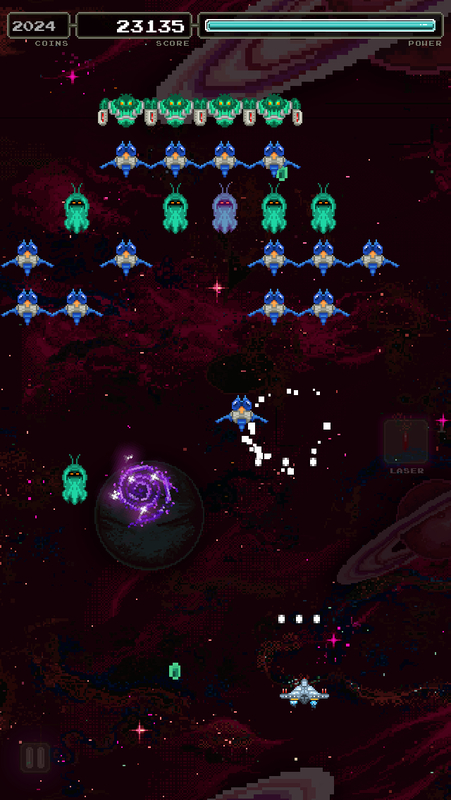 The enemies will zoom in from off the screen in lines, settle into a formation, then proceed to dive bomb you in smaller groups. Unlike Space Invaders Extreme with its techno-retro design, Galactic Nemesis looks decidedly like something out of the late-1980s arcade scene. It’s more colorful and detailed than Galaga, the particle effects are maybe a bit too modern to pass, and the game obviously runs at a higher resolution, but it feels like it could have come from a similar era otherwise. The gameplay, however, is an odd bit of fusion of old and new. Your ship can move vertically and horizontally on the screen, helping you weave your way around the charging enemies and their bullets. There are also a few power-ups that will pop up between particular waves, offering you a shield, a laser attack capable of wiping out an entire wave in a second, a fast-shot that speeds up your rate of fire, and a health pick-up that refills your energy bar. Rather unlike early shooters (and most recent ones, really), you can take a few hits in Galactic Nemesis. Bullets will do a little damage, contact with the enemy considerably more. Similar to Sky Force 2014 (Free), another fine shooter that breaks from the bullet-hell mold, you can power yourself up between games using the coins you earn by beating enemies and clearing missions. There are multiple ships to buy, and each one can be powered up with a faster shot, a more durable shield, and a longer-lasting laser blast. While the ships can be a bit pricey, you can also earn them by beating groups of stages, so the economy works out okay for the most part. 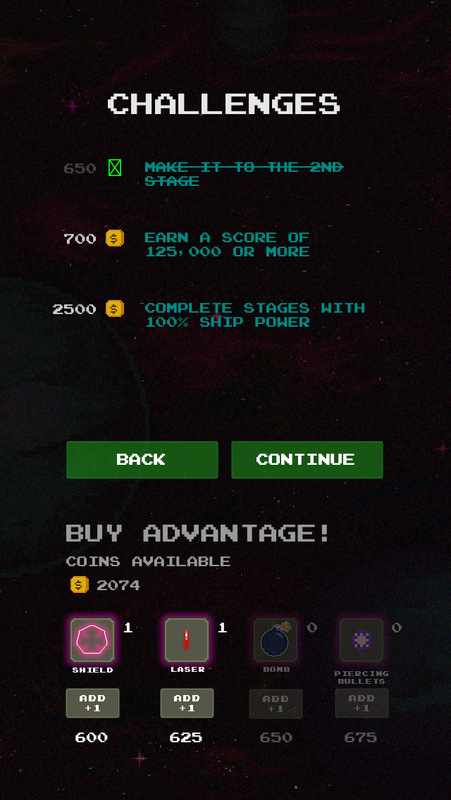 If you’re really good at the game, you’ll be earning plenty of coins to power-up and unlocking ships for free. If you’re not so good, well, you can still get the cool ships anyway, you’ll just have to save up the coins from your failed attempts. The missions give you a ton of coins, but at least half of them are pretty tricky to pull off. That’s a good thing for the game overall, but I suppose little solace for those having trouble progressing. The game offers up a fairly hefty selection of stages. There are 36 in all, grouped into sets of four. New enemies appear continually as you progress, with the toughest creatures from a few levels ago soon demoted down to peon rank for even nastier foes. 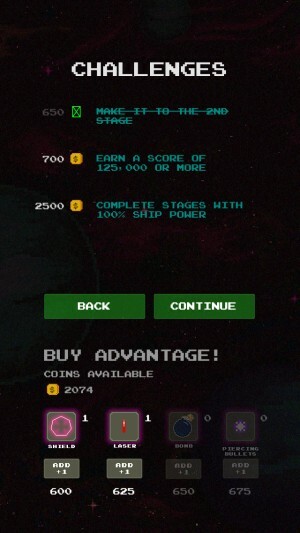 Every 12 stages, you’ll move to a new background and unlock a new set of ships to buy. The change isn’t simply cosmetic, either, as each new area introduces a new obstacle or two that makes it harder to get at the baddies. The developer promises more to come, so we’ll have to see what happens there. While you wait, each 12-stage course has an endurance mode you can run to see if you can rack up a high score. Game Center leaderboards keep track of each episode, an essential part of any game with a score challenge. While each individual stage isn’t very long, the game still packs a pretty good punch content-wise, and the difficulty curve is just right. Those who have played a few shooters on iOS will get on with the controls right away. They use a familiar relative touch scheme where you can put your finger down anywhere on the screen and move your ship around. Shooting is automatic while your finger is down, and your power-ups are activated at the touch of a button on the side of the screen. They can be a bit tricky to get to in the heat of things, but I imagine that’s by design. The pause button is smartly located in a position that’s accessible without being easy to accidentally trip. One thing I personally don’t like is the lack of an area to put my finger in. The idea behind relative touch is that you won’t block your view of the action with your finger, but Galactic Nemesis uses the whole screen for its playfield. As a result, you’re usually covering your ship, working a bit too close to the edge of the screen, at an odd angle where you can’t push your ship to all edges, or having to push your ship forward a bit more than is comfortable. Many shooters put a kind of border or bezel so that allow you full control without any fuss. I’d love that option here. Galactic Nemesis generally feels quite good to play, with good explosions and lots of feedback when you hit something. Its modernized take on the wave-based shooter gives it plenty of character to stand out among a fairly competitive genre on iOS, and there’s a pretty good amount of content and challenge for the price. On top of that, it’s always nice to see a quality shoot-em-up with no IAP to ponder over. I’m also impressed at the way it manages to pay its respects to Galaga without outright knocking it off. It even brings lots of sensible ideas of its own to the formula. As one of the many old fans of that game, I’m very pleased with Galactic Nemesis. I’m not sure Namco could have done any better themselves.